As much as I like statement pieces to add personality to my wardrobe, I rely on classics to be my staples or go-to pieces. The word "classic" can sometimes conjure up boring or plain, but classic garments in themselves are meant to be the backbone of your wardrobe. A crisp, white shirt, great fitting black pants can be seen as functional, not beautiful but it is the cut and small details that can make these garments special. 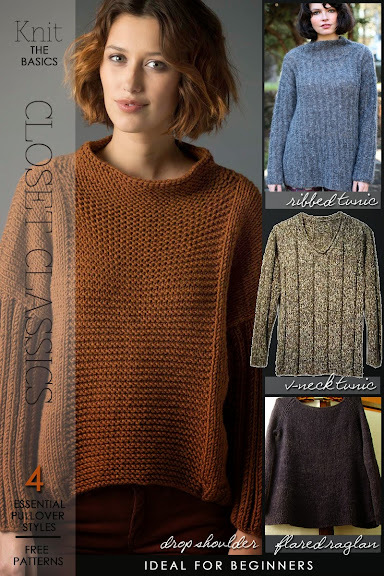 Every wardrobe should have some kind of knit pullover to throw on over jeans, whether you suit this season's oversize tunic style or the flared swing shape. 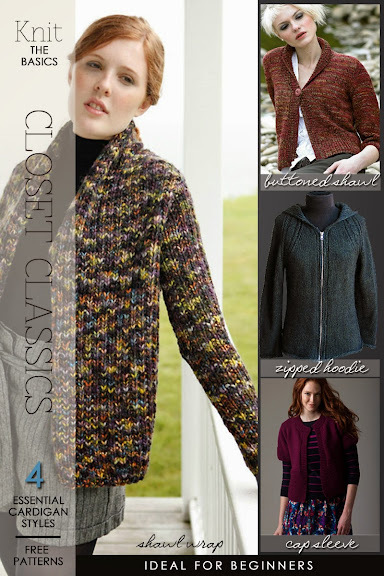 Both styles are classics, can be knit in stocking stitch in a luxurious yarn. This is where scarves and statement jewelry complete the look. A great classic piece is also about shape, whether the sleeve has a new proportion, lengths are played with or necklines are fresh and appear modern. The easiest way is to knit your classic in a great new colour or textured yarn such as a tweed or marl. 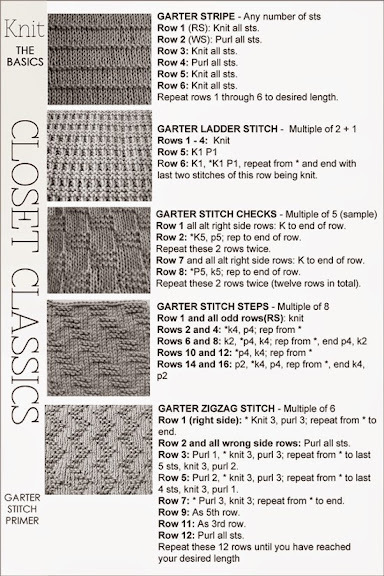 Read further for different styles of classic pullovers and cardigan patterns. There are a couple with my name on them! Good ol' garter stitch. There are so many interesting ways to add garter stitch pattern to a simple stocking stitch pattern. The zigzag pattern would be especially attractive on either side of a middle panel of straight garter. Try a whole front in checked garter with the back in straight garter. An easy way to try all these stitches is to make a scarf with blocks of garter as shown in this past post, Patchwork Scarves. For those of you learning to knit, there are excellent videos below guiding you through casting on, simple stitches such as knit, purl and garter and finally how to cast or bind off your stitches.